The country's fiscal deficit during the April-August period rose to Rs 3.38 trillion($63.96 billion) or 65.7 per cent of the full fiscal year 2012/13, government data showed on Friday. The economy continues to be in the doldrums with the data for infrastructure sector growth for August coming in at 2.1% compared to 3.8% in the same period last year. The department of telecom said on Friday it would ask mobile operators to stop offering third generation 3G services in circles where they do not have spectrum. The move comes after the government in December 2011, said that it was illegal to offer 3G services beyond their allotted circles. After announcing to make roaming services free across the country by next year, Telecom Minister Kapil Sibal on Friday sought to make voice calls free for subscribers. The rupee rose to a five-month high on Friday, helping it gain the most in 13 quarters, as global risk sentiment improved, and the government stuck to its original borrowing plan, showing further signs of fiscal discipline. Punjab has now become the largest beneficiary of the foreign direct investment made by German wholesale retailer, Metro Cash & Carry. The company has already invested Rs 370 crore in the state to set up its cash and carry stores, vegetable collection centres besides establishing a supply chain structure. 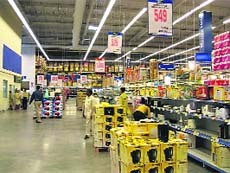 Metro Cash & Carry, Bangalore. Research In Motion Ltd reported a narrower-than-expected loss on Thursday and the struggling BlackBerry maker bolstered its cash reserves, sparking optimism ahead of the launch of its make-or-break line of next-generation smartphones. During the same period in the last fiscal year, the deficit was 66.3% of the budget target. 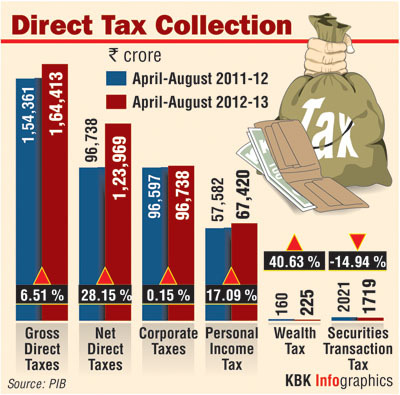 Net tax receipts during April-August period stood at Rs 1.75 trillion and total expenditure was about Rs 5.7 trillion. In March, the government had budgeted a fiscal deficit of Rs 5.14 trillion or 5.1% of GDP for the current fiscal. On Thursday, the finance ministry asserted its commitment to containing fiscal deficit by sticking to its borrowing target for the year despite it being at over 50% of the budget four months into the year. But economists speculate that an increase may come a few months close to the end of the fiscal. "We’ll complete second half borrowing by end of February... we’ll try to keep fiscal deficit target," said department of economic affairs secretary Arvind Mayaram. "The government will borrow Rs 2 lakh crore in the remaining period of the current fiscal." The government budgeted to borrow Rs 5.7 lakh crore this fiscal, or 5.1% of GDP, including repayments. In the first 6 months, it has borrowed Rs 3.7 lakh crore so far. According to an official statement, the moderation in growth was on account of declining output of crude oil, fertilizers and cement, indicating persistent sluggishness in the economy. The cumulative expansion of these industries in April-August 2012 slowed to 2.8% from 5.5% in the same period last year, according to official data released Friday. The eight industries include crude oil, petroleum refinery products, coal, electricity, cement and finished steel and have a weight of 37.9% in the overall Index of Industrial Production (IIP). "The core sector numbers are bad. It will have its effect on IIP as well," Principal Economist D.K. Joshi said. Natural gas and crude oil production contracted by (-) 13.5% and (-) 0.6%, respectively in August. Fertilizer and cement output also shrunk by (-) 2.1% and (-) 2.4% during the month under review. Steel and electricity production slowed to 1.8% and 1.7%, respectively. In the comparable month, it was 7.9% and 9.4% in that order. However coal and petroleum refinery output grew by 11% and 8.4% in August, respectively. 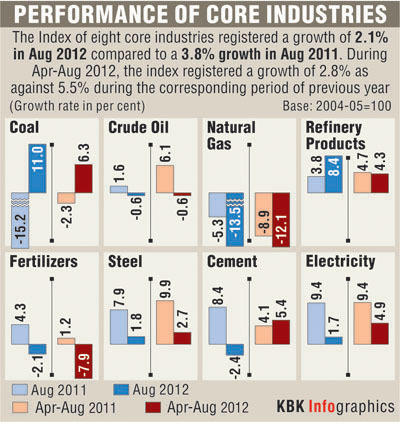 The eight core sector industries have a weight of 37.9% in the overall IIP. Growth in infrastructure sector industries in May, June and July, too, had moderated to 4%, 3.6% and 1.8%. DoT has readied a show cause notice which will give operators three days to shut down the service. In addition, the DoT may impose a penalty for licence violation. “A decision had been taken (on 3G roaming pacts) and notices will go out. These are show cause notices as well as advisories to stop services with immediate effect…I expect they’ll go out today,” DoT secretary R. Chandrashekhar said. Although companies have 60 days to respond to the notice asking why action should not be taken against them for violating the rules, they will have to stop services immediately, he added. While mobile licences allow operators to enter into roaming agreements, in the case of 3G services the operators have ahead and are selling connections even in areas where they do not have spectrum. Earlier,roaming agreements for 2G services were primarily done to cater to subscribers who travel from one circle to another. But 3G services operators have got into an agreement, whereby connections are being sold in the same circle. The government has decided to waive spectrum fee for community radio services (CRS). The telecom ministry will soon evolve detailed guidelines to ensure that the spectrum is optimally used and the channels use these airwaves only to inform and empower the common man. An official statement issued Friday said the move had come after requests received from National Advisory Council of the information & broadcasting ministry and the Community Radio Association for waiver of spectrum charges for community radio services. Communications & IT Minister Kapil Sibal has asked DoT to evolve detailed guidelines by October 12 to ensure spectrum is optimally used. After announcing to make roaming services free across the country by next year, Telecom Minister Kapil Sibal on Friday sought to make voice calls free for subscribers. Speaking at the CII broadband summit Sibal said mobile phone operators must move from voice-based revenue model and subscribers should gradually be charged only for data services and not for making calls. “There should be no charge for talking to each other. I personally believe charging for voice is a tax on talking to people,” Sibal said while adding that “at the moment, revenue of industry depends on voice, it is time that the industry decides to move in a direction where revenues come from data and not from voice". He added operators needed to “change their mindset” by moving away from voice services to data. At present, the operators earn most of their revenues from voice-based services. Sibal’s wish for making voice calls free comes within days of his announcing that mobile phone subscribers would not have to give roaming charges from 2013, which have a strong effect on telcos’ revenues. Global investors have been wary about the rupee, primarily due to the country's twin deficits — fiscal and current account, with ratings agencies threatening a downgrade to 'junk' status. The rupee's gains were further aided by a strong global risk sentiment after Spain unveiled a crisis budget, which many saw as a precursor to the country seeking a bailout. "There has been an absolute change of sentiment for the rupee. The outlook looks positive on hopes of more reforms and capital inflows," said K.N. Dey, director at Basix Forex & Financial Solutions, an advisory firm. "I expect the rupee to gain to 51.50 to the dollar by end-October or November." The company is operating in India as a wholly-owned subsidiary of Metro Inc., and has already set up two stores in the state in Ludhiana and Jalandhar. Its third store will be opened in Zirakpur on October 18, while another store at Amritsar is expected to be operational by the yearend. With four stores across the state by the end of this year, this is the maximum investment made by Metro Cash & Carry in any state of the country. Company officials said Metro plans to invest Rs 900 crore in Punjab in a phased manner. The company, which operates only as a wholesale retailer and has no plans of entering direct retail, also has plans to set up its stores at Patiala and Bathinda. On an average, each store in the state is spread over 60,000 square feet area, and is selling 12,000 to 14,000 items. “Once these four stores go on steam, we’ll be setting up the others in Bathinda and Patiala, a company spokesperson said. Punjab is one of the seven states where Metro Cash & Carry has launched its operations. It has set up stores in Karnataka, West Bengal, Andhra Pradesh, Maharashtra, Rajasthan and Delhi. So far, it has invested close top Rs 2,000 crore in setting up 11 stores across the country. The spokesperson said with 18 states having amended their Agricultural Produce Marketing (Regulation) Act, they saw a big business opportunity. In all the states where Metro Cash & Carry currently operates, most of the fresh produce is being sourced from local farmers, to be retailed through these stores. In fact, 30% of the total goods retailed by the firm are these food items, which are procured locally. RIM shares surged 20% in after-hours trade on indications the firm will have plenty of cash to ramp up production of its new BlackBerry 10 devices and mount a robust marketing campaign for the revamped line, due in early 2013. 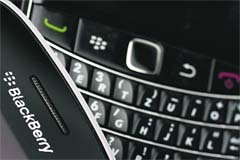 It was the biggest jump for the stock since a 50% surge in December 2003, underlining the importance of the BB10 launch. The company, which has fallen far behind its rivals in a smartphone market it once dominated, has staked its future on the BB10 and its completely redesigned operating system. Ricela Health Foods plans to set up a Rs 15 crore unit to produce dietary supplements from rice derivatives at its Sangrur plant. CMD A.R. Sharma said the firm is also setting up a Rs 15 crore plant in Dhuri for production of oryzanol concentrate. He added it had also sponsored a study at PGI, Chandigarh to ascertain whether rice bran oil has better cholesterol lowering properties than olive oil. HSBC Holdings said Infosys co-founder N.R. Narayana Murthy, the only Indian on its board, would retire as its director at the end of 2012.